You will hear me say it again and again, there is no better way to sweeten a cocktail than with natural juices from fruit, this one really gets credit here. Ever since I started making Strawberry Infused Vodka to go in my Strawberry Cosmo recipe, the staff had to be prepped for the random questionnaire from observant bar guests. 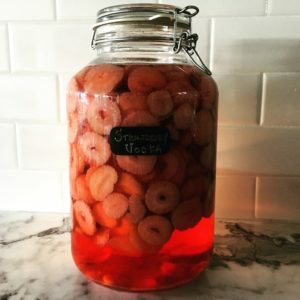 Of corse you can do this with Vodka, Rum or Tequila just fine, i would shy away from doing a strawberry whisky just because it doesn’t seem right and Gin really does belong in the association of another infused agent with more of the herbal or savory type.